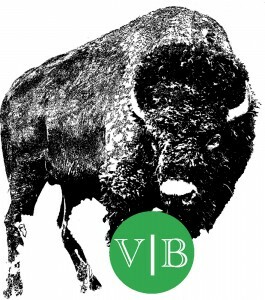 North Buffalo is happy to see that they have a new Public House where residents and vegetarians can eat, drink, and be merry! UPDATE: On 7/31/17 a loyal reader contacted me to say that Public House has since removed their vegetarian option. Please be advised! I’ll soon be back with an updated entry on the status of this restaurant for alternative eaters. There’s a new pub in town called The Public House of Buffalo at 1206 Hertel Avenue, Buffalo, NY 14216 and it’s serving up dozens and dozens of amazing beer and some dang good tasty bites. Perhaps the first time I wandered into the Public House, I was a little tipsy from drinks at Mes Que, so I didn’t fully appreciate this pub for the vegetarian friendly establishment it is. Nevertheless, aside from it’s cool exterior, awesome interior, and beer choices galore, it actually has some things vegetarians/pescetarians can fully enjoy just as much as regular pub goers. The first time I went to Public House, me and my group of friends sat at the bar, took the bar tenders recommendations to heart, and tried some fantastic craft beers that we hadn’t been familiarized with before. Some brews came from bottles, most from draft, and over all they were really good. While my friends got sandwiches for lunch, I went for seared scallops, since I always appreciate a nicely seared scallop. For any other pescetarians reading this, they were some mighty fine bivalve mollusks. One side could have used a touch more of a searing finish, but these medium sized saltwater clams were fresh and the sauce was tasty. Definitely a win. The second time I went to Public House I met another friend there. I recalled that Public House had high chairs, and it was the perfect location close to both our North Buffalo homes, so we plopped her little man into the clean high chair and ordered ourselves a lunch beer, since this was definitely the place to do a lunch beer. While Public House of Buffalo specializes in craft beer, it doesn’t limit itself to local craft, which is pretty fantastic. My girl friend had a 21st Amendment Hell or High Watermelon Wheat Beer (which while even the canned stuff is good, she and I both swear it’s better on tap, which is how Public House was serving it), and I asked for something sour, so was brought a bottle of Ithaca Cruiser Berliner Style Weisse with a cold glass. 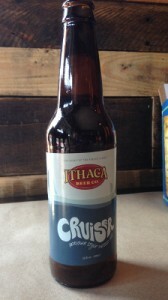 I must say I’m a sucker for the sours, and this summer seasonal from Ithaca Brewery totally hit the spot! Public House Veggie Burger is absolutely awesome! It might be one of the best veggie burgers in the city. My friend said she was going to go for the veggie burger which threw me for a loop. Perhaps I was a little further gone than I realized last time I patronized this pub, because I totally didn’t realize they had a veggie burger. But indeed they do have a black bean and chickpea burger patty, served up on a kaiser roll with lettuce, tomato, and onion with incredibly tasty double-fried french fries. While she added cheddar cheese and bacon to hers, I only asked for some swiss cheese on mine. 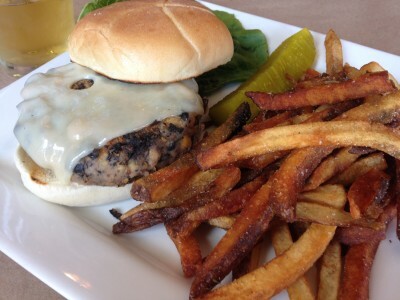 Public House Veggie Burger is absolutely awesome! It might be one of the best veggie burgers in the city, to be perfectly frank. Even my girl friend said that it was one of the best veggie burgers she’s had in a while. I must agree with her as she mentioned she didn’t care for it when veggie burgers came as bean mush formed into patties, but actually liked biting into something with texture. While smashed black beans where the glue that held the patty together, it was full of other intact, thoroughly cooked black beans and chickpeas that provided some substance to the burger. It allows for the patty to maintain its shape while being chowed down on without completely losing its form and squishing to practically nothing between the bun, which I hate in a veggie burger. I do wish that I had asked for some mayo on the side to somewhat moisten up the bun, but I most certainly wouldn’t call the veggie burger dry. It was fresh, tasty, and certainly a win. 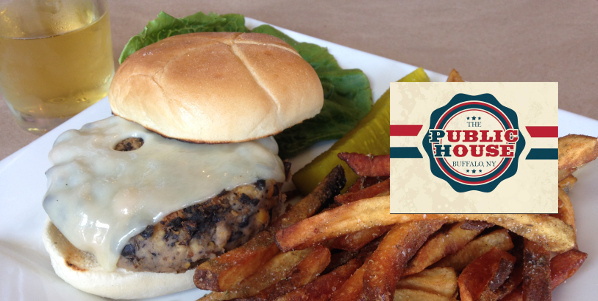 All in all, it makes for a perfect black bean burger. Public House of Buffalo features specials as well, so depending on the day, you might be able to find something vegetarian friendly. If not, their veggie burger is hands down a solid reason to visit this pub. Go there with a deep thirst and large appetite, you’ll be very, very happy you did! 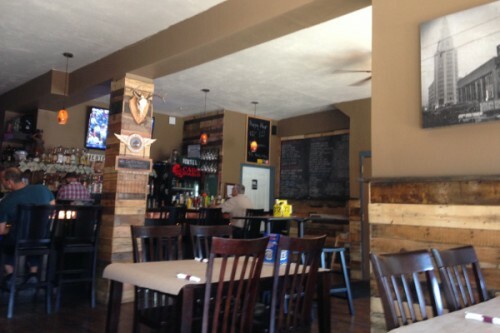 Read the Public House of Buffalo Yelp Review here!